The Ilot K block by Atelier Vera & Barrand Architectes explores a new method for making the city today. 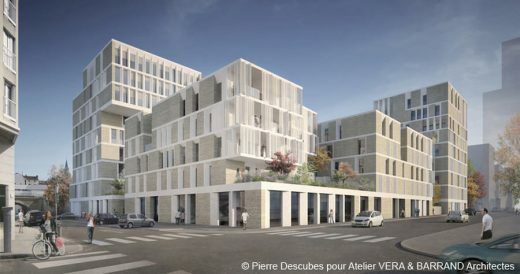 The “Ilot K” block holds a special place in the geography and the temporality of the development of the Confluence project in Lyon. The last bastion of Phase 1, in direct contact with the old city and the “Perrache” blocks, it is designed as a whole, continually, to test new rules concerning planning, sustainable development and vertical mixing of uses. Its design is similar to research, the laboratory and the workshop. It is the forerunner of a new, more collaborative and interactive way of conceiving the city. It incorporates a different distribution of the players’ roles in the development which requires revisiting all aspects of the design process. The approach is in contrast to the architect’s usual design mechanisms. All planning assumptions are continually re-questioned, and the design scheme progresses by trial and error. Another difficulty is added to this way of working: that of not yielding to the temptation of drawing, in order to develop the project without giving immediately it any architectural image. Motivated by the desire to innovate and to break ranks, this is by no means designing a system. The team then considered many different scenarios regarding uses, floor areas, typologies, technical solutions, circulation systems, building services networks, etc. Therefore the model is the ideal tool for research and communication for the firm and the workshop. The transition from academic research to integration into the existing city will make the K block exceptional in several respects. These include the originality of the urban response and the willingness to imagine new ways of life in the city, but the most exemplary aspect is reinventing a way of working and new design processes. The K block becomes a turning point in the history of La Confluence and prefigures the spirit and working method of Phase 2. It is a life-size laboratory in real time. The method used was the workshop. It brought together all experts involved, from July 2010 to March 2011, promoting interactive group work. The players watch “live” as the design scheme is developed. The Working Group brings together the client (Nacarat), the developer (SPLA Confluence), the Technical Services of the City of Lyon, the Grand Lyon urban area authority, the architect-planner of the Mixed Development Area (Atelier Ruelle), Tribu HEQ [High Environmental Quality] consultants, Architectes des Bâtiments de France (French Historic Monuments conservation agency), Voies Ferrées de France (the French railways owner), SNCF (the French rail service company), consulting firms (Batiserf, INEX and EGIS) and the project management team (Benoît Crépet, Yves Moutton and UrbaLab) around the Atelier Vera & Barrand firm of architects, the project leaders. It is a perilous exercise. It shapes a design scheme that is constantly questioned. The players are involved in an empirical trial and error method to find solutions that they had not imagined. The design scheme is not a finished object that is closed to all requests: it is devised by requirements, constraints and wishes that are sometimes conflicting. The architect is the central character of the workshop. As the guardian of the standards of quality, he avoids the pitfall of loose, passive consensus that is inherent in many contributors, and he strives to maintain the original ideas. The project management team is not set up and the projects are not distributed as for the other blocks. Previously, the subdivision of the plot anticipated the allocation to the architects, whether under the responsibility or not of a lead architect. For the K block, the architect is responsible for coordinating the overall project. He surrounds himself with conceptually similar designers who will be involved in the project. The desire to mix types of use and/or occupancy, which is now a real credo in planning terms, is the result of two related ideas: the pooling and saving of resources that it creates, and therefore reduced spending, particularly in terms of energy; and the desire for a diverse, changing and living city, as opposed to the “functional” city. The superimposition of different programmes – housing, offices and businesses, shops, and parking silo – with varied massing and outlines is the very essence of the scheme. It is specific in that it is designed as a whole, in one same architectural style, to “make the city discreet and complex”. It is one single building in which the volumes have been sculpted to allow in as much light as possible and, at the same time, to avoid depriving the existing city of sunlight. The relationship with history is important for the K block because it is at the edge of the Sainte Blandine district, north of Rue Bichat. To comply with the characteristic neighbouring building envelopes (60m x 80m), it occupies its entire plot, and its facades line the boundaries. Considering pollution, mainly from the railway along the east, the block was placed on a thick base, with housing units as far away as possible from noise and pollution, and oriented to receive maximum sunlight. North-South through passages suggested the creation of a true inner courtyard in the block with a hanging garden, accessible by two generous staircases. The K block is composed of six buildings, K1 to K6. The programme is divided into strata in this way: the ground floor level covers the entire plot and includes the entrance halls, business premises, shops, service rooms, and the low car parking level. The hanging garden is on the first upper floor. K1 and K2 contain social housing. K3 includes part of the parking silo and offices on the upper floors. K4 contains a part of the silo and social housing on the upper floors. K5 and K6 are reserved for offices on the lower floors and for housing units for sale on the upper floors. The environmental approach is considered as more low-tech than high-tech, less technological and smarter. Focus: mixing and pooling. The pooling of services installations systems in order to save energy is one of the objectives of mixed-use development. It is based on the idea that homes and offices are used at different times of the day, and it is not necessary to duplicate the services installations. Regulations require the separation of most building services systems, but it should be noted that, in Block K, energy production by one single boiler will divide consumption by two. The next step was to define the materiality of the project, to give it body, draw it and then build it. The scheme had to progress from the model to the architectural principles. Two preliminary principles seemed essential for the architects: to avoid the pitfalls of a simplistic Manichean response that expresses the various programmes too sharply, and to design a building as a whole and show its differences gradually. The architectural firm focused on determining architectural systems that can be the same in all programmes, with slight variations in dimensions or construction. These are repetitive elements that concern door and window openings, structural components, the building envelope, doors, windows and joinery, and window-shades, blinds and shutters. These elements will vary according to the programmes but also according to the areas of the island, depending on sunlight and on the framing of views between the wide landscape and the nearby neighbourhood. The thickness of the facade, firstly, which results from a cultivated relationship with the material, and from the aim to again create architecture of strongly “mineral” character, which has been lost lately. Making honest use of materials by not going against their application in normal construction standards and regulations. This concerns the invisible part of the project and contributes to its quality and success. The form becomes just as important as the meaning, but the design scheme is not driven by a preconceived form.